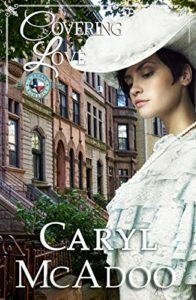 Covering Love by Caryl McAdoo is a Christian historical romance. It is the eighth book in the Texas Romance series but can be read as a stand-alone. As with all Caryl McAdoo’s novels, it is beautifully written. The epic story of the Buckmeyer family continues. Much of the novel is written through the eyes of six year old Evie. She seems much older and wiser than her years. The novel is cleverly written. It is almost a two in one as Evie proof reads a story penned by the famous May Merryweather. The tale is cemented by letters passing between the two. There is both a maturity and an innocence in the character of Evie. This endears her to the reader. The family all pull together under the patriarch Henry Buckmeyer. His wishes are key. The novel shows the power of dreams. God spoke through dreams in the Bible. He continues to speak through dreams today. There are the themes of family, forgiveness, trust and guidance. Submitting to God and following Him is of vital importance. Another cracking novel in the Texas Romance epic. I am looking forward to the next instalment. Enter to win the set of the Texas Romance series – 8 books. Hey Linda! Thank you for stopping by and commenting! I hope you get to read them all, too! 🙂 Blessings! Thank you so much for the wonderful review, Julia! And for being a part of my Celebrate Lit Blog Tour! I feel highly favored to call you and Sandy Barela (at Celebrate Lit) my friend! WOuldn’t it be fun if I could do a European tour like May Mreiwether did between books three and four? Then we could meet in person! Love and hugs! Thank you so much for the wonderful review, Julia! And for being a part of my Celebrate Lit Blog Tour! I feel highly favored to call you and Sandy Barela (at Celebrate Lit) my friend! Wouldn’t it be fun if I could do a European tour like May Meriwether did between books three and four? Then we could meet in person! Love and hugs! Hey Carol, Good luck with the new book launch! I’m so excited for Caryl’s newest release! Thank you for being part of the tour.